As we've traveled along OS X's byways and thoroughfares, we've encountered a couple of ways to communicate--via email and through text with Apple's Messages application. In this lesson we'll explore a third method: FaceTime, Apple's video chat technology. Described by some as "Jetsonian" and "the future come to life," FaceTime allows you to place and receive free video calls. It's a feature bundled with Mac OS X Lion and Mountain Lion, and it's found on iOS devices that include a front-facing camera. (On an iPhone it's implemented within the Phone app.) To use FaceTime with your Mac, your computer must be connected to a camera. 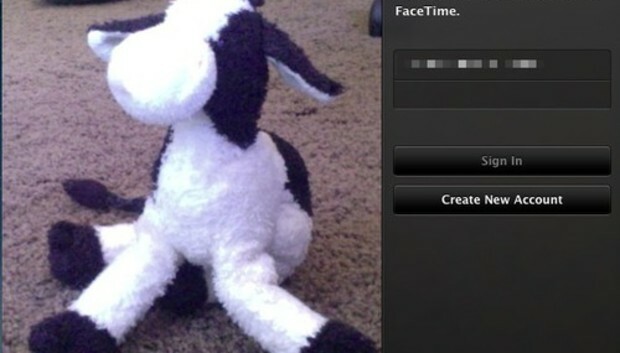 It can be a built-in FaceTime camera (formerly known as an iSight camera), as found on Apple's laptops and iMacs, or you can use a Mac connected to a compatible USB or FireWire camera. If you've configured your Mac with an Apple ID (as you should have by now), you'll find that you're ready to receive FaceTime calls. Just launch the application, and the FaceTime window appears. On the left side of the window, you'll see the image that your Mac's camera captured. On the window's right side are the addresses associated with your Apple ID, as well as an empty password field. Enter a password and click Sign In. When you've done this successfully, people who know your address will be able to call you over FaceTime. If you haven't configured your Mac with an Apple ID, you can enter it in the user name field, enter your password, and click Sign In. And if you don't have an Apple ID, you can get one by clicking the Create New Account button. When you click Sign In, the resulting pane will show you any addresses and iPhone phone numbers that are associated with your Apple ID. If you have more than one associated address--both an icloud.com address and a me.com address, for instance--you'll see each address listed. If you have multiple addresses, you can uncheck any that you don't wish to use. For example, many people may still know you by your me.com address, and so you may choose to use that rather than your icloud.com address. Click Next. Apple will verify your addresses, and you'll go to the All Contacts pane. This pane contains all the names you've stored in the Contacts application. Click a contact's name to see any iPhone numbers and email addresses entered in their contact card. Click the entry that you know to be associated with a contact's FaceTime identity, and FaceTime will initiate a call. Note that if you choose to use someone's iPhone number, you're not limited to calling them on their iPhone. That number is associated with their Apple ID, which means that even if you choose that number and place a FaceTime call to it, FaceTime will "ring" on any devices associated with that Apple ID. So, you might call that number, but the person you're trying to reach may pick up the call on their iPad, iPod touch, or Mac. When we first talked about Messages, I walked you through video chatting within the Messages application. FaceTime on the Mac works similarly. When you establish a call--as caller or recipient--you see a window with two images. The larger one is of the person you're speaking with, and the smaller one is your image. Within the chat window you have a few options. Move your cursor over the window, and a small gray bar appears at the bottom. The first button in this window lets you mute your microphone. It comes in handy when you shout "That jerk, Scooter!" after your helpmeet asks "Who are you talking to?" If the number or address you click isn't associated with FaceTime, you'll see a message indicating that the person is not available for FaceTime. Regrettably, this "not available" message isn't always helpful--and not because it's possible that the item you clicked really is associated with the person's FaceTime account. It's just that they've switched off FaceTime on the devices they use to receive FaceTime calls. A more helpful message would state: "I'm sorry, but no FaceTime account is associated with this item." In the end, the onus is on you to obtain from your pals their FaceTime contact information, much as you'd ask them for their email address and phone number. Once you have that information, you can make calling contacts a bit easier. The way to do that is to launch the Contacts application, choose View > Groups if the Groups pane isn't showing, choose File > New Group, and then create a group for just the people you want to contact over FaceTime. Select those people with FaceTime entries, and drag them into the group you just created. Then, in the FaceTime application, click the Groups button that now appears, and choose your FaceTime group. If you wish to add a person to your list of FaceTime contacts, there's no need to launch Contacts. Instead, within FaceTime, just click the plus (+) button in the top-right corner of the window. The sheet that appears includes fields for first and last name, company, mobile phone number, and email address. Click Done to add the contact not only to FaceTime but also the Contacts application. At the bottom of the window, you'll see two entries next to Contacts: Favorites and Recents. Favorites, as its name suggests, is a list of any contacts you've chosen as your top-o'-the-pops. To designate a contact as a favorite, simply click the name in the list of contacts and then click Add to Favorites. Alternatively you can click Favorites at the bottom of the window, click the plus (+) button at the top-right of the window, and then choose contacts from the list that appears. Recents holds the names of anyone you've recently chatted with over FaceTime, along with the date and time of your chat. If you click the right-pointing button to the right of the person's name, you'll see their pertinent contact information as well as the length of the call. (Or a "failed" message if the call didn't go through.) In this pane you'll also find the Add to Favorites button. If you wish to edit this contact, just click the Edit button and add or subtract phone numbers and addresses in the resulting pane. Click Done when ... well, you know. Speaking of editing contacts, you can edit your own to the extent that you can add other addresses that people can use to contact you over FaceTime. For example, you may have an iCloud account, but a lot of people know you by your Gmail address. It's a simple matter to add the Gmail address so that they can use this account to contact you. To do this, choose FaceTime > Preferences. The Preferences sheet will scroll up and display your current means of contact. Below the list of current contact email addresses is an Add Another Email field, which I encourage you to click. Now just enter the new address and press Return. Apple will validate the address and then add it once it gets the A-OK. It's also in this pane where you can choose how your caller ID will display when you place a FaceTime call. If you have an iPhone, its number will probably show up here, but it needn't do so. Just click that number, and the pane displays any email addresses you've added. Choose one, and it will appear to those people who receive your calls. Two other items here are worth your attention. The first is the FaceTime On/Off toggle. If you don't wish to be reached over FaceTime on your computer (you prefer, for example, to conduct such chats on your iPhone), just flip the toggle to Off. When you click View Account and then enter your Apple ID's password, you can sign in to your account and change your name and password. If you click the Manage Apple ID link, your default Web browser will open; there you can enter your Apple ID and password, and then go to a page for managing elements of your account (such as the credit card associated with it). In the pane where Change Location and View Account appear, you also have the option to sign out of your account. Do so, and you return to the Sign In screen you saw when you first launched FaceTime. This screen is useful for more than signing in to your usual Apple ID. If you have more than one Apple ID, or if you're using a friend's or family member's Mac, you can sign out of the usual account and sign in with another. Although this requires more steps, it's a bit like using someone else's phone to make a call. And that's the miracle of FaceTime--a way to make video calls without spending an additional nickel.